With fantastic sea views and air conditioning this six bedroom villa has good sized, well appointed accommodation and a larger than average private pool and separate guest apartment. Fantastic sea views. Villa Magnolias is located in the Cumbre del Sol area with stunning sea views and between the towns of Moraira and Javea. This very well presented six bedroom villa is tastefully furnished and presented by the owners to offer home from home holiday living! Recommended. Villa Magnolias can be accessed into the main hall via a few steps up to the front door from the street with parking available. 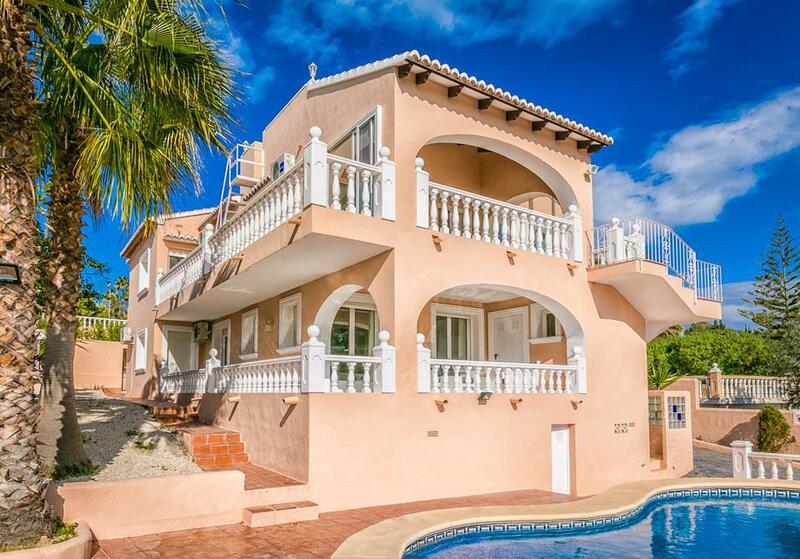 There is also access from a double car port at the rear of the villa that leads up 13 steps to the pool level apartment and then a further staircase to the main villa. The main entrance leads into a large lounge/dining room with feature fireplace, comfortable sofas, a flat screen TV with some UK satellite channels, a DVD player, dining set and French doors leading to the terrace with incredible sea views. There is an attractive spiral staircase leading from the lounge to a galleried mezzanine area ideal for reading and relaxing with air conditioning. The independent modern fully fitted kitchen has range of eye and base level shaker style units and includes a range cooker, integrated dishwasher, large fridge/freezer and microwave. A door from the kitchen leads to a small terrace and steps down to the pool level. On the main level there are four bedrooms, two twins and two doubles all with fitted wardrobes. Both doubles and one twin bedroom have air conditioning. The two double bedrooms each share a bathroom with Jack and Jill style doors giving access from both or either room! This bathroom has a walk-in shower, WC, separate bath with shower over and twin sinks. The two twin bedrooms share a shower room with large walk-in shower, WC and wash hand basin. On this level there is large terrace for dining al-fresco overlooking the pool and with great sea views! A staircase leads down to the larger than average 10m x 5m private pool with Roman steps, hand rails and a poolside shower. From this level the independent two bedroom apartment is also accessed. It has doors leading straight out onto the pool area and consists of a comfortable lounge, kitchen and two further bedrooms, both doubles with air conditioning and a shower room with walk-in shower, WC and wash hand basin. There is a separate utility room on the pool level with the washing machine and a sink. The gardens are stepped and gravelled and filled with shrubs and fruit trees. On a clear day you can see the island of Ibiza from the terrace too!! On the pool level are further open views. We had a wonderful holiday. The villa was awesome - absolutely brilliant and our family will remember it for years and years. We're only sorry that we think we may have left a dirty barbecue and a used filter in the coffee machine... sorry!! !